Akrocean, the cost effective and accurate response to your in-situ offshore data needs for renewable and scientific projects. A new generation of floating LiDAR turnkey services. WINDSEA is the first stabilised floating LiDAR, hybrid and clean powered (wave and solar energies) and benefiting from a 365/7 supervision through an onshore control center. 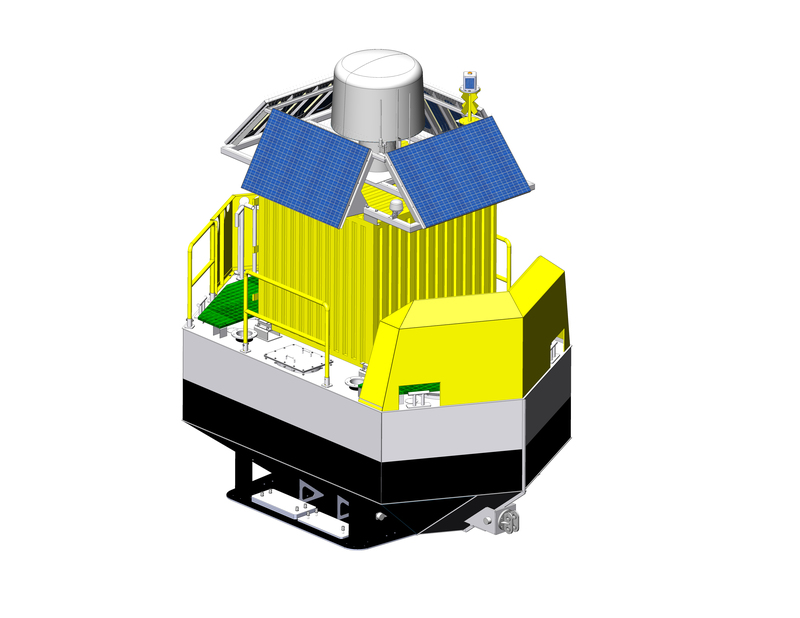 The floating LiDAR offers much power and plenty of spaces to host other ocean observing systems (including a second LIDAR) to share the monitoring costs. A modular service covering all client’s environmental monitoring needs. These anchored floating platforms act as powered and stabilised base platform hosting multi sensors ocean observing system (Ocean sensors, LiDAR, Hydrophones, Radar, Sonar, drones,…). The hosted maritime container can be equipped and re-equipped endlessly avoiding multiple nautical operations and sensors redundancy. The first Floating Radar offer for Birds & Bats detection. FLY’R SEA is a turnkey service designed for Birds & Bats detection and quantification at sea, using a 3D floating radar. Akrocean innovates offering a service supported by an association of experts in the field of marine data acquisition and processing : Gaïa Terre Bleue (Marine environment expert), Diades Marine (3D avifauna radar manufacturer) & LPO ( Avifauna expert). Akrocean services are based on WAVEPEARL technology from GEPS Techno. GEPS Techno has developed and proven hybrid and stabilized floating platforms. Akrocean was born in Nantes, city of Jules Verne which have imagined the wildest and most utopian machines and creatures. In each of his novels, Jules Verne enters the Sea and has made his heroes cross the oceans even the most unknown. In line with raising customer needs in term of meteo and environmental monitoring or assessments, Akrocean values are innovation to fullfill customer needs and reliability in order to deliver reliable and efficient services to customer. Due to that, Akrocean chooses to cooperate with innovative partners like Geps Techno for stabilised buoys dedicated to floating lidar solutions and Valemo for advanced O&M services and big data treatment systems. 17.04.2018 | AKROCEAN, starting the type 2 validation process of the Carbon Trust Roadmap, set up its second buoy at the Fécamp met mast. The company had already entered the floating LiDAR market with a first commercial deployment off the island of Oléron. AKROCEAN, winner of the "2018 Energy Transition Trophy"
15.05.2018 | AKROCEAN has been rewarded for its energetic transition initiatives with the "2018 Energy Transition Trophy", in the "Technology" category, contest organised by the "Usine Nouvelle" magazine. 14.06.2018 | AKROCEAN innovates with three main partners (Gaïa Terre Bleue, Diadès Marine and the LPO) to offer a new turnkey service : FLY'R SEA, an avifauna radar placed on its stabilised and autonomous powered platform. [#FOWT2019] @MauriceWOLFF13 : "Les 4 Régions Françaises - @regionbretagne, @Occitanie, @paysdelaloire & @MaRegionSud - qui jouent un rôle locomotive dans le développement de la filière, ont décidé d’unir leurs forces et ont fait le choix d’un soutien collectif à @FOWTEvent"